Pit Bike is a very interesting piece of iron. If it could talk it might tell you some fascinating tales. This bike is a 1970 Schwinn Paramount (#G7016) that I got off eBay a couple of years ago. 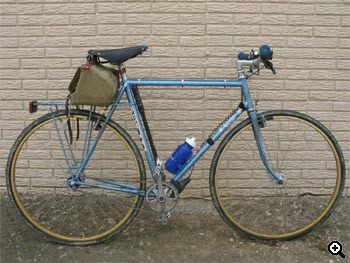 Whoever built it brazed a thinwall steel tubing rear rack onto the frame, and later added cantilever brake bosses. The folks at Waterford have no records on this bike, they think someone just misplaced them back in the 70s. I think someone rode it out the back door after building it up as a personal project bike or somesuch. A couple of months after I got it #7015 showed up on eBay painted a darker blue metallic and minus the rack. These two bikes had to have been built by the same hand but I have no idea who that might have been. The 27" gold rims are laced to a Campy Record hub in front and a Suzue flipper in the back with a 16t fixed and 20t freewheel gears, tires are 1-1/4" Continentals. Old canti brakes stop the thing NOW and the riser bars make it a little more forgiving when the going gets slippery. The Baggins bag carries all I need to keep it rolling, along with a 6-pack of refreshment when necessary, and the Brooks saddle just had to be. A bizarre throwback to the early 70s touring crowd, this bike gets positive reviews wherever it goes, especially in the pits at local races. This bike is just cool any way you measure it. Chuck is a techno-stud who stomps the bugs out of other people's software for a Dallas hi-tech company. He owns around ten different bikes, mostly oddball stuff like the old Schwinn shown, and is a medium-core gutter bunny riding ten miles each way several days a week through the Dallas automorons. Next time, Chuck will be showing off his vintage Rockhopper. 27" conversions are a 63xc.com staple. Check out recent offerings from Adam, Brian and The Gonterian, to name but three.